Inflammatory Bowel Disease (IBD) is a diagnoses used for a variety of intestinal disorders found in dogs and cats. The disorders are characterized by an abnormal accumulation of inflammatory cells in the lining of the intestine. One common form of IBD that your veterinarian may have diagnosed in your pet is called lymphoplasmacytic enteritis. Your veterinarian may have diagnosed this after obtaining a biopsy which shows an abnormal accumulation of inflammatory cells. Other causes of inflammation such as parasites, bacterial or viral infections, exposure to toxic substances and pancreatic causes of small bowel disorders would have been ruled out. Signs that your pet may have lymphoplasmacytic enteritis include chronic diarrhea, weight loss, vomiting, loss of appetite, nausea (licking of lips) and gurgling noises in the intestine. The vomit may contain bile and in cats it may contain hairballs. There may be mucus, blood and straining with bowel movements. Stress can also be a triggering factor for Inflammatory Bowel Disease. Just like people, when pets are emotionally upset (e.g. if left in a cage for boarding), this can trigger an onset of IBD or digestive symptoms. Please consider your pet's emotional health and try to keep their routine as normal as possible. Many pets with digestive issues have anxiety and stress is definitely a trigger. We have had EXCELLENT results using Psystabil along with some of the digestive products to help rebalance and calm pets. When you travel, consider having a pet sitter come to your home rather than boarding them. Many pet digestive disorders occur because of the pet’s food allergies or food intolerances resulting in malabsorption, inflammation in the GI Tract and poor utilization of nutrients. Most likely your pet was given a "novel" protein diet. You may be giving your pet “premium” food or even a prescription diet but it may not be right for your pet. Your pet could still be allergic to it or intolerant of some of the ingredients. For example, a novel protein, hypoallergenic diet that is using rabbit as the protein source may still contain a high amount of carbohydrates in the form of peas which are hard to digest. Many of the best selling, premium brands contain grains and hidden fillers that can cause a variety of digestive problems and subsequently, a weakened immune system. Every time your pet eats the food, he or she has a reaction, causing more inflammation which can result in vomiting, diarrhea and intestinal discomfort. Since so much of our immune system is located in the intestinal tissue, digestive disorders affect our immune system as well. Thus, while steroids such as prednisone may temporarily quiet the inflammation, it is essential to try to heal the pet from the inside out using an improved diet and digestive supplements for IBD. Pets with Inflammatory Bowel Disease (IBD) should eat a grain-free, hypoallergenic diet. Finding the right diet for your pet with IBD can be quite a challenge because these pets can be very sensitive as well as picky. A frozen raw, canned or modified homemade diet can be very helpful but what is most important is to avoid proteins that your pet may not tolerate. For example, poultry can be a problem for many pets with IBD. Dry kibble can be especially difficult for pets to digest as well. While dry kibble is convenient for pet owners, there are much healthier options for pets to eat. 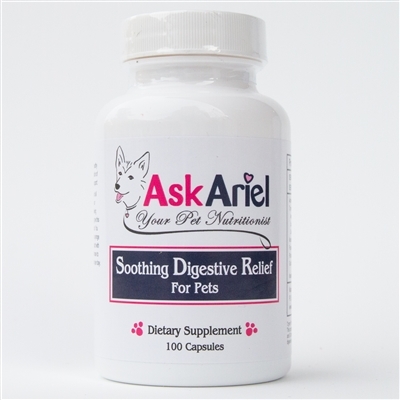 Most pet owners find that just by making some small modifications to the diet along with a powerful probiotic and digestive enzymes, their cat or dog's digestion quickly improves. Many times pet owners have been to several veterinarians and specialists with no improvement. Patience is needed with pets that have IBD. 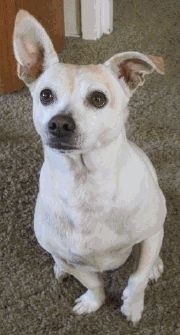 Ask Ariel has had many success stories and we have had extensive experience working with pets that have this condition. There is hope. You can help your pet heal the inflammation by using a comprehensive holistic nutrition program. 1) Change your pet’s diet to a hypoallergenic, grain-free food as this will reduce overall inflammation. Many times, pets with joint and muscle pain are overweight. The excess weight will hasten the development of arthritis by increasing the pressure on the joints. Work with your veterinarian or pet nutritionist to ensure the amount of food you are feeding is appropriate and that your pet is at a healthy weight. Include what you are feeding your pet on the order form at checkout and Nutritionist Susan Blake Davis will include a free diet suggestion on the packing slip that comes with your order. 2) Use natural, veterinary-approved supplements to help improve your pet's digestion and repair the intestinal lining. While medications may control symptoms, it is essential to support your pet's digestive process each and every time your pet eats by using Power Probiotic and one of our Digestive Enzymes. Using Colostrum for Pets and/or the IBD Kit can help repair your pet's digestive tract. 3) Finding the right diet and supplement regimen can often be the key that finally controls your pet's digestive symptoms. Prescription diets may not resolve the problem as they often contain iingredients your pet cannot tolerate. (Click here to read about prescription diet foods.) Working with a veterinarian knowledgeable about nutrition and/or a veterinary nutritionist is essential as the trial and error process can be taxing. Moreover, it is not unusual for IBD to be misdiagnosed. Feline intestinal lymphoma and other forms of cancer can be misinterpreted as IBD even with biopsy results. Sudden changes in bowel habits of a senior pet should be addressed with your veterinarian promptly.